Insect-borne diseases — such as malaria, dengue, West Nile and the newly emerging chikungunya — infect a billion people every year; more than a million die each year and many more are disabled. The effects of climate change, according to Edwin Michael, professor of biological sciences and member of the Eck Institute for Global Health at the University of Notre Dame, mean these deadly diseases are no longer reserved for the developing world. Michael is working with an international team of researchers to project how climate change will affect mosquitoes, flies and ticks that carry diseases afflicting humans. Recently published in a special issue of Philosophical Transactions B, a peer-reviewed publication of The Royal Society, the collective research from this international consortium delivers the bad news that insect-borne diseases are emerging and, in some regions, having a resurgence. The research highlights and points to the critical need to take into account the interactive, contributory roles that climate, epidemiological, environmental and socioeconomic factors play in disease transmission when forecasting the future impact of these diseases around the globe. The spread into regions including Europe and the United States will cause and force significant public health interventions to address this emerging global problem. Many areas of Europe, including the U.K., could become highly suitable for mosquitoes that transmit dengue and chikungunya over the coming decades. 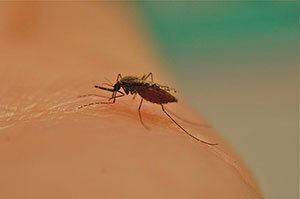 The potential for climatic changes to affect the effectiveness, cost-effectiveness and policy decisions of whether to scale up future vector control programs against malaria. Evidence that vectors may evolve in under a decade to changes in temperature. The need for better data on the links between vectors, diseases they carry and the environment. The conclusion that one of the most effective ways of protecting human health against climate change in the long term is to further strengthen current disease control efforts. Originally published by Sarah Craig at news.nd.edu on April 16, 2015.